Huckleberries. These are right up there with my absolute favorite fruits, they might even take the top. I have wonderful memories of going up into the mountains as a young girl with my cousins to pick these little gems, and coming away with scratched legs from tromping around in the bushes and purple-stained fingers and mouths. Their flavor reminds me of a cross between a raspberry and blueberry, tart but slightly sweet… like little candies. Of course, they’re nutrient-dense. Full of vitamins and antioxidants, even minerals like iron and calcium. I understand that not everyone will have access to huckleberries, but boy they did not disappoint! To get a similar flavor profile, I would use a combination of blueberries and raspberries instead. Slice banana, put in the freezer, and let freeze several hours until solid (I typically do a big bag at a time so there is always some in the freezer). 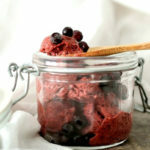 Once frozen, add slices (I usually break them up for easier blending) to a high powered blender or food processor, along with your huckleberries. Use as many as you'd like. The more the better! Blend until super creamy. 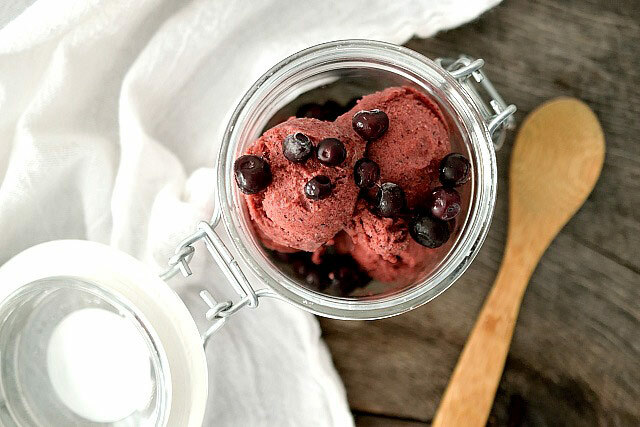 Alternatively, if you want berry pieces, first blend the banana until creamy and then add the huckleberries, blending until they are chopped to your desired size. Taste and add more huckleberries if needed. Eat as is, like a soft serve ice cream, or put in freezer until it sets to desired consistency. Top with a handful of whole huckleberries or whatever you'd like. Enjoy! 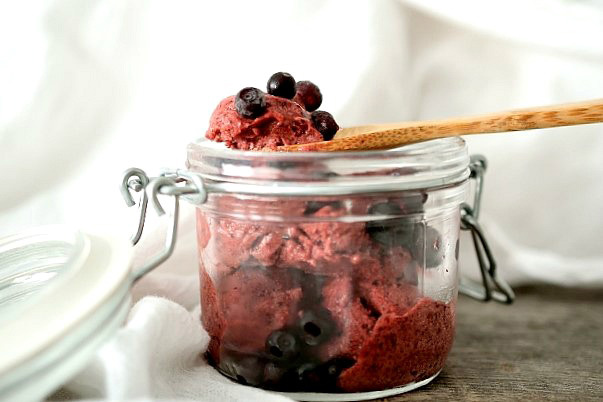 You'll need a high powered blender, like a Vitamix, or a food processor.